The WeatherTech window shade protects your dash and keeps your interior cooler in the sun. Each and every day people who live in sun baked areas are leaving their vehicles unprotected and vulnerable to harsh sun rays. Over time sun rays will bake the interior of your vehicle affecting your dash, seats and any other interior product. These harmful UV rays will crack, fade and simply deplete any value from your interior. This is why it is important to take measures in combating the sun. WeatherTech understands this importance and makes this a simple task. 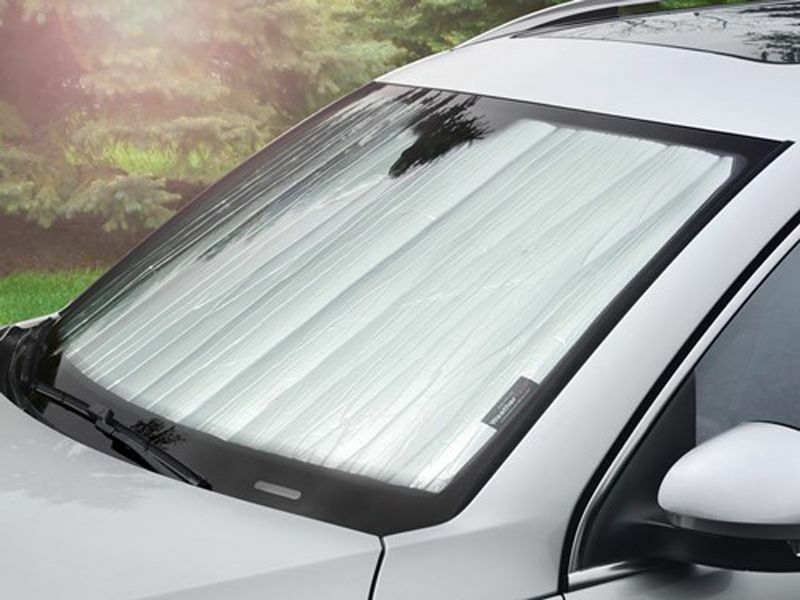 The WeatherTech windshield sun shade was designed to block harmful rays in the summer and wards off frost in the winter. This unique sun visor has 2 sides and both are designed for a purpose. In the warmer and sunny climates use the reflective film side to instantly deflect harmful UV rays, keeping the cab of your car, truck or suv cool. And in the winter months there is a specially concocted material which absorbs heat and sun rays, warding off frost. These amazing sun shades are one of a kind. They are easily installed and when not in use, you can simply roll up and stow away until the next use. 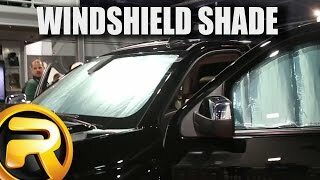 Not only do the WeatherTech windshield sun shades help with combating the sun and frost, but they are also great for keeping prying eyes from peering into your vehicle. Out of sight, out of mind! So if you're in need of a protective barrier from the sun, frost and unwanted visitors, you have found the best on the market! These sun visors will exceed all your expectation and more. Made by WeatherTech. WeatherTech is offering a 3 year warranty on this windsheild sun shade. 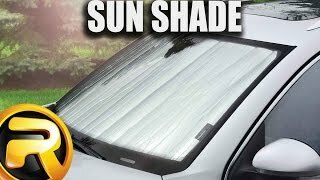 The WeatherTech windshield sun shade offers an easy installation. For sun baked areas, put reflective side towards window and for cooler climates reverse. For additional information please call us at 1-866-309-1907 or 701-253-5906.